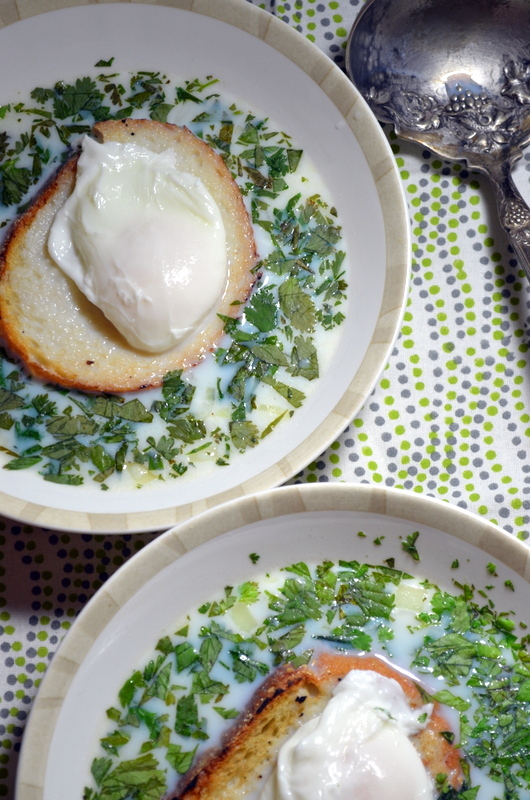 This soup hails from Colombia’s capital, Bogotá and is eaten for breakfast. It works wonderfully after a night of drinking to cure a resaca. The first time I had this breakfast was when my mother-in-law made it for us after she returned from visiting her family in Bogota. It was delicious! 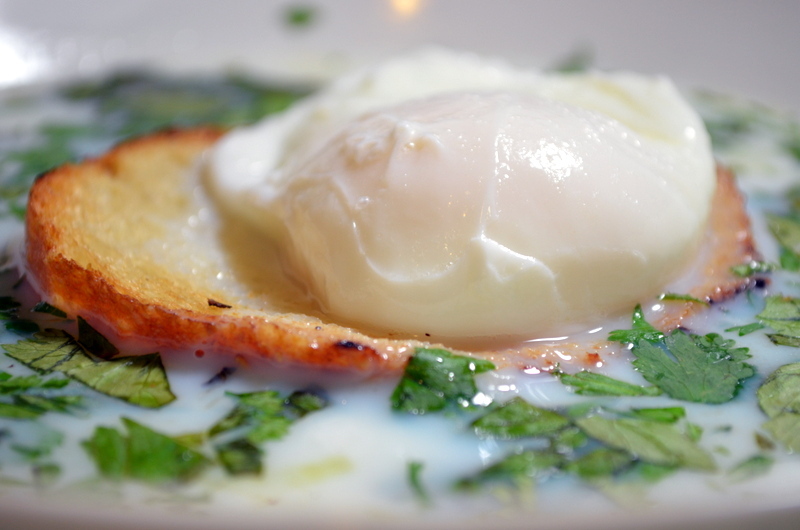 The cilantro, eggs and toast in a broth just hit the spot. It became our request for every time we visit her. I attempted this Colombian classic as a way to celebrate the Juanes concert we just went to see and to honor some of the Colombian traditions that I have admired so much over the years. Juanes is one of Colombia’s most popular singers from Medellín. I, along with many others, have had an admiration for (crush on) him for quite some time now. I’ve turned to his music to motivate myself before daunting situations, for comfort in trying times and as drinking anthems. Walking home from work one day, I saw that he was playing right here in Radio City Music Hall and I sent out the call to all the other fans I know. We got our tickets the next day. Incidentally, my mother-in-law got tickets too, completely independently. Juanes coming town is like a son of Colombia coming up to visit his family and we would all be there to welcome him. This changua is a simple ode to Juanes, kissed with just the right amount of fresh cilantro with the added magical power of awakening your senses and alleviating pain from the night’s excess. Place the water and milk in a saucepan, season with salt and pepper and bring to the boil. Crack the eggs individually onto a plate and carefully slide each one separately into the boiling soup without breaking the yolk. Cover and continue to boil for 1-2 minutes. 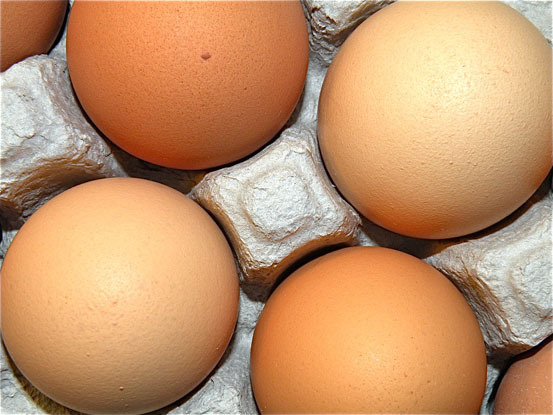 Carefully scoop the eggs out with a big spoon when cooked to your liking. 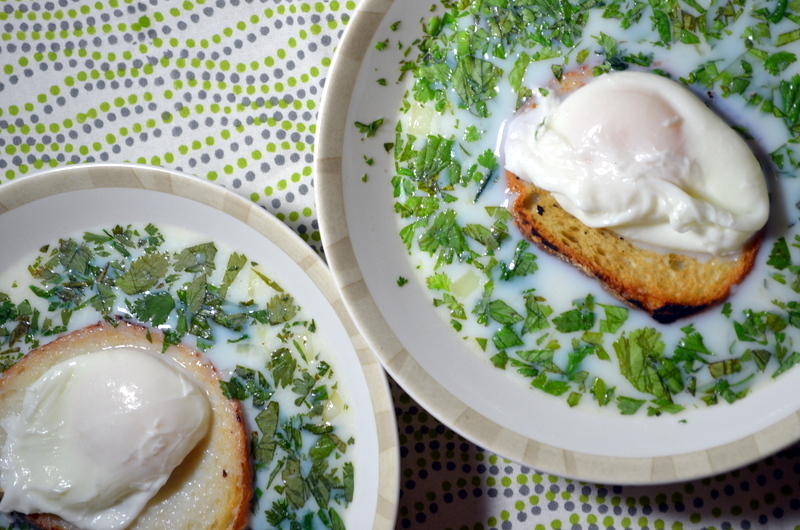 Divide the spring onions and cilantro between 4 serving bowls, then float the toast on top of the soup and carefully place one egg on top of the toast. OH WOW. 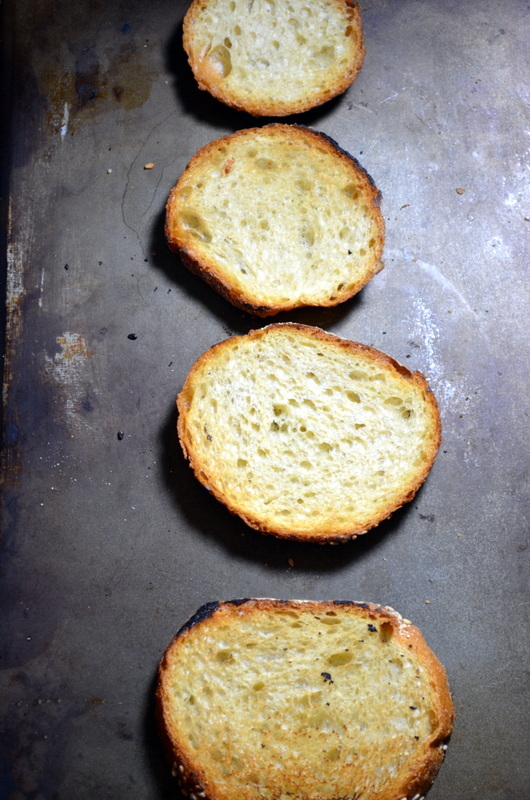 I am out of cilantro, otherwise I would be making this right now, even though it is 6 PM. I am definitely making the soup as soon as I get my hands on a bunch. 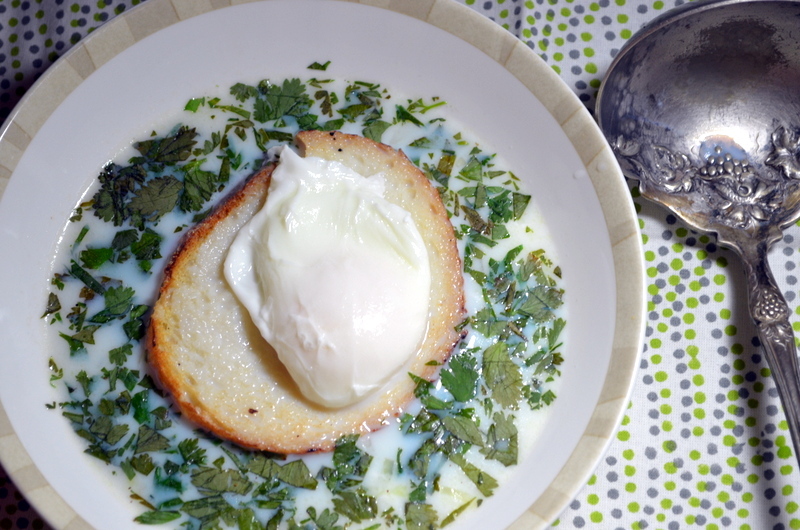 I am an egg FANATIC, and this is just the kind of dish I cannot but love! Plus, I know nothing about Colombian cuisine, which makes it even more interesting to me. Thank you!!! Thanks, Darya! You and I both love eggs on anything. It definitely needs salt and pepper because the ingredient list is so short, but I love it. This is a regional special. Outside of Bogota people don’t really eat it. So good. Let me know how yours turns out! Aw. That’s a beautiful thought. There is something very nostalgiac about colombia. Maybe it is their troubled history or the love the people feel for their country. Enjoy! Thanks for the comment. Amanda, it’s so nice to find your blog. And I’m hooked by this post alone. 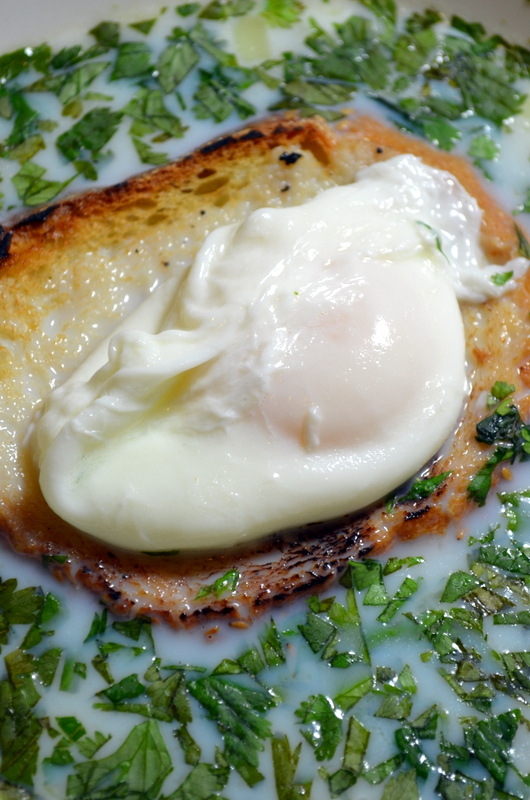 I am very curious about breakfast food in various cultures around the world and loved reading about this soup which looks wonderful and yummy and I would like to make as soon as possible and have a feeling it’ll make its way to my brunch menu as well. Thanks so much! I’m glad to have discovered yours as well! I’ve been obsessed with Persian cuisine lately and just bought a book based on Fae’s recommendation so I’ll definitely be spending some time in your online space! Breakfast is my favorite meal and I appreciate learning about new ones. When we hosted an exchange student from Thailand we began eating breakfasts of eggs, soy sauce and rice and love it. Basically I can’t resist anything with an egg! Lovely recipe, Amanda. How cool! I love breakfast too. Id love to learn thai breakfast! Thanks for your comment. Your recipes keep inspiring me.